Robbie Williams has announced a tour of the UK and Europe in 2014. The Candy singer will hit the road next year with his new album Swings Both Ways. He will start the tour in Budapest on April 25 and stops will include Vienna, Amsterdam, Berlin, Leeds, Glasgow and Manchester before he closes with two dates at London's O2 Arena on July 8 and 9. The tour announcement comes days after Robbie, 39, showcased material from the record at a one-off show at London's Palladium. The singer put on an all-singing, all-dancing spectacular - with guest performances from the likes of Lily Allen, Rufus Wainwright and Miss Piggy - for an audience which included Liam Payne from One Direction, award-winner Adele and comedian Alan Carr. Tickets for all shows go on general sale at 9am on Friday December 6. Justin Timberlake has revealed he still has his eye on launching a country music career. Lily Allen will be performing at Glastonbury, she has confirmed. All Saints are set to reunite for five shows, as they support Backstreet Boys on their UK tour. Bob Dylan's Like a Rolling Stone is a getting its first official music video, nearly 50 years after the song was released. 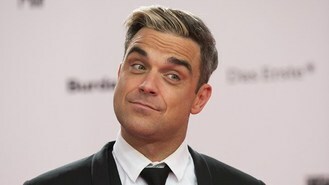 Robbie Williams could equal Elvis Presley's tally of chart-topping albums if he claims the 1,000th number one next weekend. Katy Perry has revealed she is hitting the road with a worldwide tour in 2014. Max George has revealed he has recorded a song with Flo Rida. Sir Paul McCartney has welcomed families who were forced to leave their homes as a result of the Fukushima nuclear disaster to a concert in Tokyo. Gary Barlow has revealed Take That's new songs will be "big and dramatic".